Imagine you are speeding down a highway when you see a colourful, childlike figure perched on a chair by the road side. As you come closer, the figure raises its arm and thumbs for a lift. An eccentric hitchhiker? Yes, but this is one hitchhiker like the world has never seen before — it's a robot, complete with a Wikipedia memory, talking ability and its own Twitter account. It is hitchhiking its way 6,000 kilometres across Canada, from Halifax on the Atlantic coast to Vancouver on the Pacific. The robot, called hitchBOT was created by Frauke Zeller of Ryerson University and David Harris Smith of McMaster University. It is a "collaborative art project" they say. Wearing bright yellow wellingtons and gloves to match over its blue legs and arms, hitchBOT is GPS enabled and has a 3G connection. hitchBOT started on its pioneering journey on Sunday, 27 July after a farewell from its 'family' — the team of scientists that created it and will be providing technical support through the journey. Soon after, Anne and Brian Saulnier, picked up hitchBOT after they saw it thumbing a ride, according to CBC News. 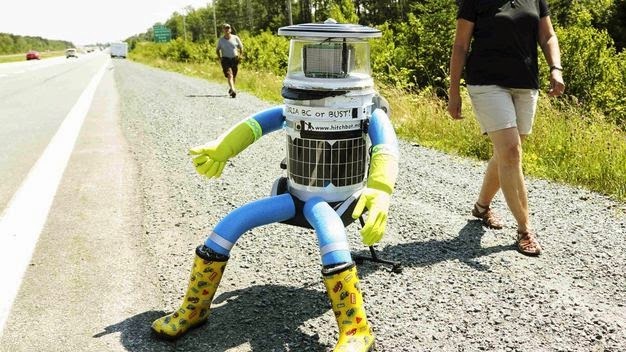 The couple was heading to Kouchibouguac National Park in their trailer van when they saw hitchBOT by the highway. "He's going on a ride for sure," said Brian, CBC News reported. "A lovely couple offered to help me out. Look out, New Brunswick. Here I come," read the robot's Twitter.